Come visit Annie's Playground at Meadowbrook, a fantastic new community-built playground in Northeast Seattle! Visit the SUDC Website for more events and information. Click here to see pictures of Annie's Playground! Annie Yasuda was a sweet and joyful little girl who loved playgrounds. She and her family were regular visitors to the old Meadowbrook playground near their home. In November 2001, Annie suddenly passed away just before her third birthday. 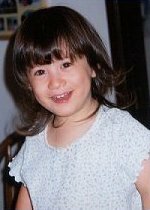 The cause of her death is being researched as Sudden Unexplained Death in Childhood (www.sudc.org). Inspired by Annie's life, her parents and a dedicated group of neighbors came together as the Friends of Annie's Playground, with the goal of building a new Meadowbrook playground. This group met every month for two years to plan and design the new playground. Funding for the playground came from fundraising events, individual donations, a Dept. of Neighborhoods Matching Grant and other other grants, and Seattle Parks' Major Maintenance Funds. Finally, in the summer of 2004, the community gathered to build the playground and create beautiful artwork with a northwest wildlife theme. This unique new playground has three large climbing structures (for kids of all ages), lots of swings, a picnic shelter, and really cool caves and tile art. Everyone is invited to come and play! Annie's Playground is located between Nathan Hale High School and the Meadowbrook Playfields, at the end of the parking lot on 30th Ave NE at NE 107th St. Or follow the path west from the north end of the Meadowbrook Community Center (10515 35th Ave NE) parking lot.